In poker, to win big, you play big, or at least that’s always been my motto. I’ve been playing the game casually since I was four-years-old and it never fails to bring out the risk-taking side of me. Recently, I found myself sitting at a dollar poker table in a casino, playing Texas Hold ‘Em. I sat there holding pocket aces. 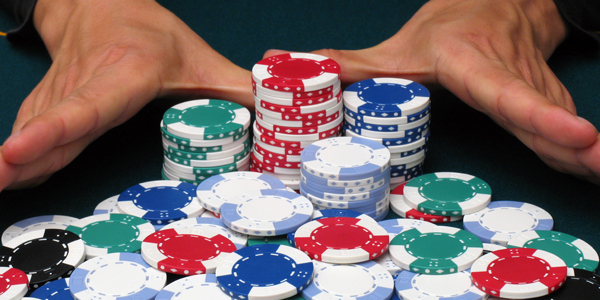 Now, all you need to know about poker is that pocket aces is a “go all in” kind of hand. It’s a hand that begs you to take all of those treasured chips in front of you and, win or lose, push them to the betting pile. But I held back, second guessing, weighing the odds in my head. Did I go all in? No. Uncertainty froze my hand to my chips. I didn’t want to lose them all. More importantly, I didn’t want to lose the game. And isn’t that what usually holds us back from going all in? We avoid taking risks that could improve our lives because in the end there’s no guarantee. This aversion to risk has frozen many people today to jobs and careers that aren’t satisfying. And it’s caused many others to avoid going after a great job or promotion because they didn’t think they’d measure up to their competition. The truth is settling for less is a big mistake – even in the wake of the Great Recession. In fact, it might even cost you a great opportunity, especially when you don’t want to risk asking for what you’re worth. When I’m hiring, I actually weed out candidates who underprice themselves because I assume they won’t perform at the level I expect. In my eyes and in the eyes of many other CEOs, job candidates actually lose credibility when they underprice themselves. Many women mistakenly think that it’s less risky to not push for more or that they’ll be more appealing if they don’t ask for what they’re worth. The bad economy might be the current excuse, but I believe most underpricing occurs because many women just aren’t comfortable with negotiating. In fact, a recent article in The New Yorker, might prove my theory right. It found that only 7 percent of women negotiate their salaries up-front when entering a new position…compared to 57 percent of men. Those statistics are pretty telling. And I want them to change. Women can and do negotiate all the time outside the workplace – with spouses, with kids, with teachers, with friends – and we can do it in a professional setting, too. It’s just a matter of changing the way you think about asking for money. Rather than think of it as a risky move, think of it as a key strategy to help you win the career or job that you’ve always wanted. If you’re ready to stop sitting back and start negotiating like you mean it, read on for nine tried-and-true tips. After all, commodities are easy to obtain and easy to replace. If the people you’re working with know that others share your skill set, they won’t have any reason to pay the price you’re asking for. They’ll be in control, not you. Don’t shrink into your chair and become the invisible employee. Do what you need to do to stand out. If you’re able to make yourself invaluable, you’ll also make yourself impossible or darn hard to replace. And when that happens, you’ll be in control of your own price. Before you march into your boss’s office to ask for a raise, ask yourself: Why do I want a raise? Do I just want more money, or am I honestly interested in advancing in this company? Wanting more money isn’t a bad thing in and of itself, but it can get you into trouble if your quest for cash mires you deeper in a commitment you’re not passionate about or causes you to ignore opportunities that might be ideally suited to your strengths and interests. Always make sure you’re negotiating for the right reasons. Have you ever noticed that women tend to downplay their accomplishments, while men routinely highlight their achievements and use them to advance? Recall the statistic on men and women making salary negotiations when they’re hired. Clearly, we females need to take a page from the male playbook and make sure that we’re getting the recognition and credit we’ve earned. If you still have doubts, consider that announcing your accomplishments validates the investments others have made in you. Your boss, for example, wants to know that she bet on a winner when she hired you! Think through what you want before you sit down to negotiate. Prepare the list of points you must have and the points you’re willing to give up. Remember that some people do keep score, so being able to track what you really need helps you let the other party win points as you score big. Remember the old adage: nothing risked, nothing gained. Don’t jump too fast to say yes to the first offer, even if you think it’s fair. It’s always smart to assess the situation, the person making the offer, and how far you might be able to go before signing your name on the dotted line. Chances are, if your request for more is denied, you’ll still be left with the initial offer. Asking for more than you think you can get is part of being a strong negotiator. You have to be your own advocate! Unfortunately, many people won’t hesitate to exploit a weakness if you let them see it. When you negotiate from a place of fear or desperation, your ability to be rational will be impaired…and you’ll also be susceptible to agreeing to unfavorable terms; in other words, anything to save the deal! If, despite your best efforts, you’re unable to banish your emotions, make an effort to appear detached. At some point or another you’ll probably find yourself negotiating with a more powerful party – whether it’s your boss, your boss’s boss, or another organization. Remember that ultimately, you’re talking to another human being. Try not to become so overawed by rank or position that you forget that! I have learned that everything is negotiable, so if you have something to offer, go ahead and negotiate! Never tip your hand. You may think that saying to a colleague, “Just between you and me, I’m asking to spearhead the new project, but I’d settle for just being on the team,” will stay between the two of you. Maybe it will – but maybe it won’t. If you let others know that you’ll settle for something, you risk ending up with that instead of with what you really want – or worse, even less. Women who aren’t used to negotiating are especially susceptible to being intimidated by a show of force – but even veteran businesswomen can be taken aback by unexpected aggression or resistance! If you find yourself in this situation, remind yourself (once again) that you are dealing with another human being and that you have something valuable to offer. Don’t be afraid to demand respect. And if you consistently don’t get it, well, it might be time to rethink whether you want to work with the other party in the first place. When I was eight-years-old, I was trick or treating with my twin brother in our hometown of New Orleans. I was afraid of many things as a child, including heights. He and I went to one of the bigger houses on our route, also known to have the best candy. But to get to the candy you had to go up ten tall cement steps. My fear of heights stopped me cold. I told myself I might stumble in the dark and drop my bag of treats. I might crash to the concrete below. I might tear my homemade fairy costume. My brother, of course, climbed those stairs and went after the candy. That year I learned that life’s treats go to those who aren’t afraid to step out and take them. Right now, more than ever, you deserve to get paid what you’re worth. Don’t let anyone – including yourself – forget what you’re capable of and just how much you’re bringing to the table.